There are three or possibly four adult saltwater crocodiles living in Vanuatu's mangroves and no current breeding population. It is said the crocodiles reach the northern part of the islands after cyclones. This is because of the island chain's closeness to the Solomon Islands and New Guinea where crocodiles are very common. ↑ Selmen, Harrison (2011-07-17). "Santo chiefs concerned over slow pace of development in Sanma". Vanuatu Daily Post. http://www.dailypost.vu/content/santo-chiefs-concerned-over-slow-pace-development-sanma?page=7&quicktabs_1=0. Retrieved 2011-08-29. ↑ Central Intelligence Agency. 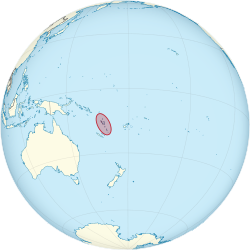 "Vanuatu". The World Factbook. https://www.cia.gov/library/publications/the-world-factbook/geos/nh.html. Retrieved January 6, 2010. ↑ (PDF) 2009 Census Household Listing Counts. Vanuatu National Statistics Office. 2009. Archived from the original on 19 January 2010. http://web.archive.org/web/20100119201716/http://www.spc.int/prism/country/vu/stats/P_releases/Adhoc/HH%20listing%20count%20release%20-%20071009.pdf. Retrieved January 6, 2010. ↑ 6.0 6.1 6.2 6.3 "Vanuatu". International Monetary Fund. http://www.imf.org/external/pubs/ft/weo/2010/01/weodata/weorept.aspx?sy=2007&ey=2010&scsm=1&ssd=1&sort=country&ds=.&br=1&c=846&s=NGDPD%2CNGDPDPC%2CPPPGDP%2CPPPPC%2CLP&grp=0&a=&pr.x=33&pr.y=9. Retrieved 2010-04-21. ↑ Robert George Sprackland (1992). Giant lizards. Neptune, NJ: T.F.H. Publications. ISBN 0-86622-634-6 . ↑ 8.0 8.1 Harewood, Jocelyn (2009). Vanuatu and New Caledonia. Lonely Planet. p. 47. ISBN 0-86622-634-6 . ↑ Bennett, Michelle; Jocelyn Harewood (2003). Vanuatu. Lonely Planet. p. 19. ISBN 978-1-74059-239-0 . ↑ "Background Note: Vanuatu". Bureau of East Asian and Pacific Affairs. U.S. Department of State. April 2007. http://www.state.gov/r/pa/ei/bgn/2815.htm. Retrieved 2007-07-16. This page was last changed on 25 September 2014, at 14:21.